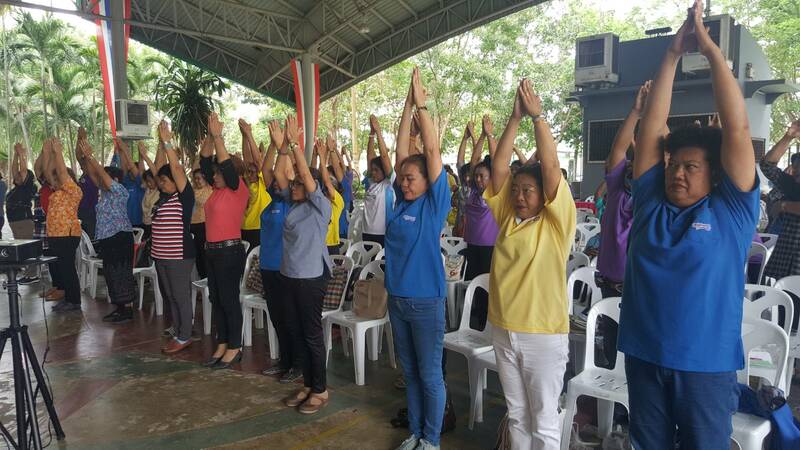 Therapists from SKT Meditation Therapy showed Nongprue village health volunteers how to teach those with chronic diseases how to meditate. Nongprue village health volunteers received updates on subdistrict projects and learned how to teach meditation at their monthly meeting. Mayor Mai Chaiyanit opened the March 18 session at the Chalermprakiat Health Garden. Wanchai Sanngam, chairman of community health management officers, updated the volunteers on the latest happenings. Among the new projects, he said, were a clean restroom initiative and a drive by public-health workers to vaccinate pets and stray animals against rabies. Therapists from SKT Meditation Therapy then showed the volunteers how to teach those with chronic diseases how to meditate. Doing so can put patients in a better frame of mind and relieve stress from their symptoms, trainers said.